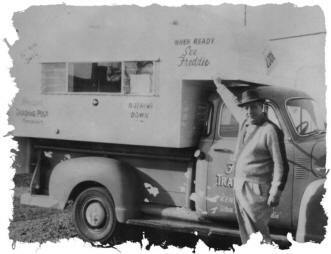 Freddies Trading Post opened in 1958 as the largest Recreational Vehicle Dealer in the area. Moving to a new location in 1971 allowed us to be the only custom pick-up canopy manufacturer in the area. With only a few pick-up bed sizes being produced, covering the bed was easy, since the only option was a wood framed unit, aluminum skin, a door and a couple windows. Times have changed and so have the vehicles, currently there are over 250 bed sizes and over 20,000 styles, options and configurations available. Now in our 3rd Generation covering beds we are also protecting them. Introducing ArmaCoatings in 1999 as our polyurethane supplier, we offer the highest quality sprayed-on bed protection on the market. Working with several accessory suppliers, distributors and manufacturers, we have thousands of aftermarket accessories available for any Pick-up, 4×4, Car or SUV. We strive to put the customer first and to provide the best quality and service available. Make the trip to Historic Downtown Kennewick when you are ready to completely transform your vehicle.